In worksheet on circle we will solve 10 different types of question in circle. 3. Draw a circle of radius 6 cm. 4. Draw a circle of diameter 5.5 cm. 5. Draw a circle with centre C and radius 4.7 cm. 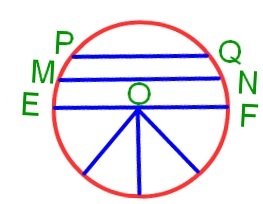 Mark point P,Q,R such that P lies in the interior of the circle, Q lies on the circle and R lies in the exterior of the circle. 6. Draw a circle whose diameter is 10 cm. Find its radius. 7. With a same circle, draw three circles first with radius 2 cm. second with radius 3 cm and third with radius 4 cm. 8. A circle has a radius 7 cm. Find the length of the longest chord of this circle. (i) Each radius of a circle is also a chord of the circle ............ .
(ii) Each diameter of a circle is also a chord of the circle ............ .
(iii) The centre of a circle bisects each chord of the circle ............ .
(i) A diameter of a circle is a chord that ………..through the centre. (ii) A radius of a circle is a line segment with one end point ………….. and the other end…………… . (iii) If we join any two points on a circle by a line segment. We obtain a …………… of the circle. (iv) Any part of a circle is called an ……………. of the circle.